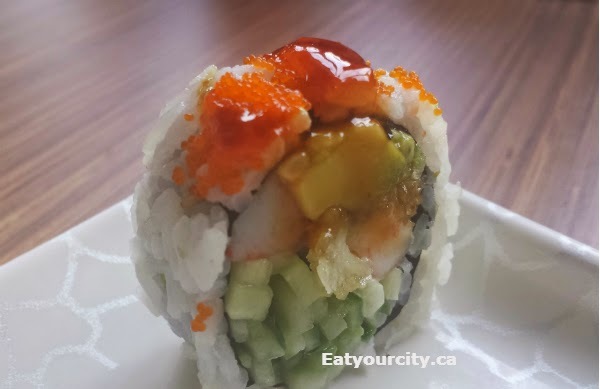 Eat Your City: Syogun Sushi, Markham ON - great deal for all you can eat sushi! 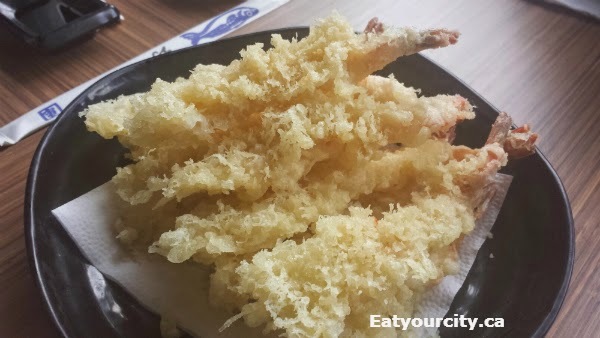 Posted by For lunch with the familia while visiting them over in Toronto for the Easter long weekend, we stopped off for a super inexpensive and tasty all you can eat sushi buffet at Syogun. 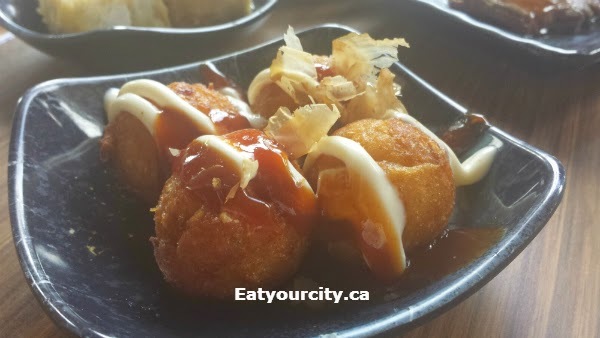 While the sushi and cooked items isn't outstanding, they are still pretty tasty - if you're not too picky about presentation, its pretty awesome... and you can't beat the all you can eat pricing. And FYI, they take cash or debit only. With the all you can eat pricing, you get your choice of unlimited canned pop or green tea. Its busy busy in here, so if your first list of orders you wanted to eat doesn't all come out (you're given a pencil and a stack of blank note paper as you peruse the menu), assume its forgotten and scribble it down on your second, third or fourth request for food to the kitchen. We started with a round of sushi nigiri. From top left going clockwise: tuna, salmon rose, mackeral, spicy chop chop, inari, hamachi, salmon. While the pieces are a bit on the small side, its all you can eat so just order more if you like. The seafood was fresh and the sushi rice nicely seasoned. Next out was the Eel Avocado Maki. Gently grilled and sauced, it was very similar to the BBQ eel cucumber maki we also ordered - tasty! I had reservations about the wasabi mussels - was it going to be so spicy it clears your sinuses or have the wasabi flavours overwhelm the mussels? 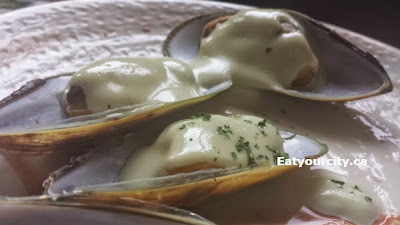 But luckily, neither was the case - the steamed mussels were topped with a creamy almost hollandaise like sauce that had just a hint of wasabi. I was pleasantly surprised by the simplicity and tastiness of the Salmon bone soup. It had a few pieces of soft tofu in it and was a rich, savoury unami nomnomnom. Then, we had some rolls - On left - Spicy salmon roll, on right - Shrimp tempura maki roll. 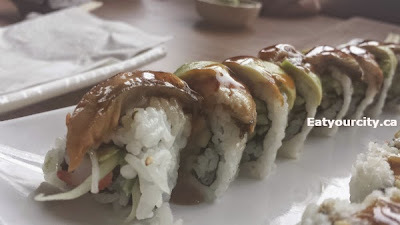 Preferred the shrimp tempura roll over the heavily sauced spicy salmon roll. 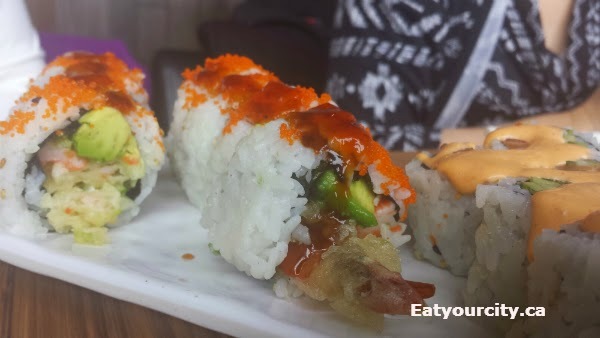 On Left Shrimp tempura maki roll, on right - Spicy salmon roll. The Tayokai balls we decent, some had bits of octopus in it, others didn't in the deep fried batter. The agedashi tofu - deep fried tofu in a ponzo sauce were good, and not too greasy. The Spicy tempura roll was on the heavier side, but tasty - can't really go wrong with deep frying a roll! As was the garlic pepper beef - nice tender bites with a good hit of garlic and a surprisingly large portion. For kicks, we ordered the deep fried salmon head and collar. It was very tasty as it was lightly salted, was a nice combination of crispy chip like bits and tender moist rich fatty meatiness. If you can get over how it looks, definitely worth a try! And finished off with a small bowl of Seafood udon - noodles, shrimp and a bit of crabmeat. And for dessert, we had some black sesame, green tea and mango ice-cream! 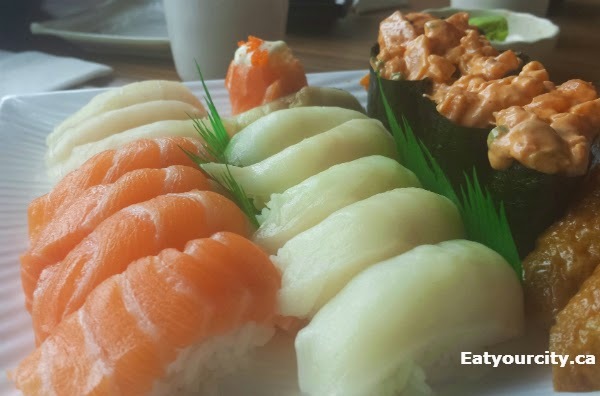 Great little all you can eat Japanese buffet with a great variety of cooked and uncooked items to choose from. Lunch buffet specials can't be beat!